Enjoying my #swag with some water and whiskey rocks. You know I don’t like to water down my water. On Thursday, April 19th, I picked up one of my best friends from high school, Katie Lemanczyk (@klemanz), and drove up to the SU Hill. We were not alone on our early morning journey; speakers, sponsors, students and attendees were all making their way to Schine Student Center for the #140Cuse conference. 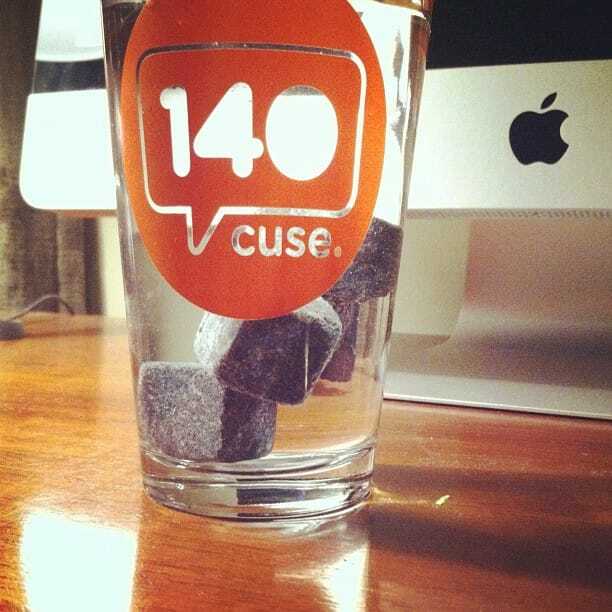 #140Cuse, a social media gathering and conference “exploring the state of now,” was organized by some amazing people at the Syracuse University iSchool (@iSchoolSU) , Communications Director J.D. Ross (@jdross), graduate student David Rosen (@dhrosen), and Professor Anthony Rotolo (@Rotolo). The conference kicked off with some public DJing on Turntable.fm. I managed to swing B.o.B’s new single “So Good,” before Rotolo took the stage. After he did, we were treated to a non-stop flurry of ten-minute presentations. The format, pioneered by Jeff Pulver (@jeffpulver), reflects the concise 140-character limit we all abide by on Twitter. The key to the format is the interconnectivity of social media. It allows for a wide range of topics to be discussed by experts, then attendees and other speakers are able to chime in through twitter and IRL (in real life). The speakers gave excellent presentations, but what impressed me was their ability to connect to attendees who wanted to chat. I had the slightly bewildering experience of realizing I was engaged in a twitter conversation with one of the speakers, Jon Glass (@jonvibe), who happened to be sitting four seats away. As we sat, watched and interacted, I found there was a common thread weaving through each presentation. We all love Twitter, Facebook, YouTube, Google+ (mostly), but at the end of the day they are just programs. They are bits of code that mean nothing without their users. We are what matter. #140Cuse and the people involved showed the world that the honest, authentic relationships we make over Twitter or Facebook are the reason we love those platforms. Our relationships and communities that we have forged through the ether are what give power to social media. So in the end it’s not about page views, or Klout, its about lives, the real people you can affect in a real way. Can’t attend a conference without the badge, Moleskine and of course Sperrys! Note: The ribbon below my thumb reads, “Hire Me.” I concur, please do. 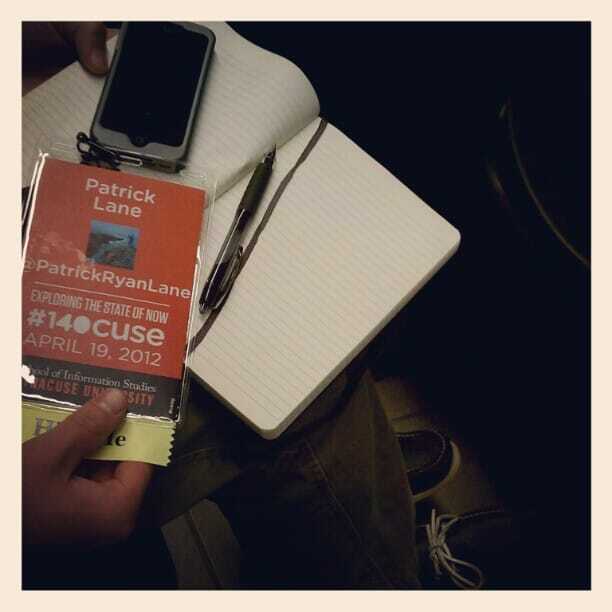 The entire atmosphere of collectivity and community at #140Cuse inspired me. I want to be a part of this social revolution. There are people, many of whom I met yesterday, who are creating connections, helping people, and making friends, all through social media. I want to join in and contribute my voice to the community. Another great speaker, with whom I had the pleasure of meeting after #140Cuse, was Lauren Bertolini (@mslaurenrae), social media manager at Gawker Media. She spoke about having to be a “Jack of all trades” when using social media in the newsroom. Sometimes you have to wear many hats to get what need to get a story out quickly enough to stay relevant. There are definitely roadblocks when corporations use social media, simply because their size renders them less agile than a startup. Bertolini suggested giving team members information they might need down the line to speed up your workflow. Gawker writers and editors have their own twitter accounts, which allow them to be more connected with readers who want to get in touch. In the end it all boils down to knowing and growing your community. Making the connections to the people who genuinely care and support what you are creating. One series of talks I wished I had seen, but unfortunately missed, was the #140Challenge Student Presentations. Sam Morrison (@samthecobra), Isaac Budmen (@ibudmen), Alyssa Henry (@alyssahenry) and Steve Rhinehart (@steverhinehart), all Syracuse University students, gave their talks during lunch (yes I was lured away by food, but I blame @klemanz and @mglane! ), in the hope of winning a spot on the #140Conf speaker list in NYC. Isaac, co-founder of Little Tinker Co. (@littletinkerco), and a family friend, emerged victorious. Isaac may have won, but Sam, Alyssa, and Steve were not left out. Thanks to the generosity of Jeff Pulver, all four students will be attending the #140Conf in NYC, June 19/20 (I highly encourage anyone who can to attend). Congratulations Isaac! 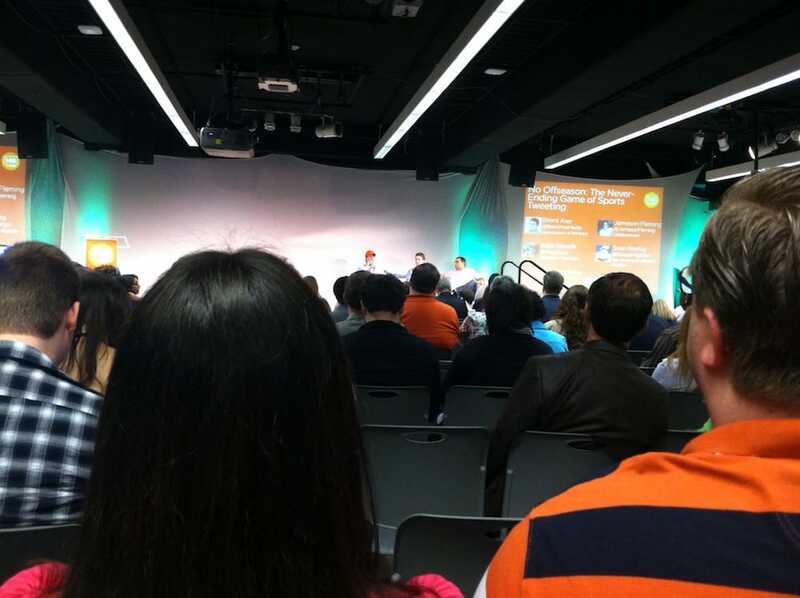 I’m so glad I decided to attend #140Cuse IRL; it really gave me great insight into how I can use social media more effectively and how I can make friends through my interactions. I often tell people about my trip backpacking through Europe (my friends would tell you that it’s all I talk about), and I liken meeting people in hostels to meeting new friends in kindergarten: You see a group of people hanging out, you are shy looking at the ground, then suddenly they ask you to play cards and you become best friends. It’s the same in the world of social media, no matter who you are or where you are from, that’s all any of us really want, just a #friend.